When I was younger and didn’t realise how short life is, I tried to plough through Charles Dickens’ books. I’d be drawn in by the fascinating characters and themes, but would soon be defeated by the denseness of the writing – it felt like wading through treacle. Bleak House was particularly frustrating, with tantalising hints of story drowned out by lengthy descriptions of English case laws. 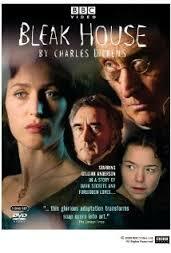 But I did find a way to enjoy the best of Dickens and dispense with the obstacles, thanks to the BBC box set, first Oliver Twist as a teenager, then the stylish adaptation of Bleak House in 2005. Book lovers often shudder when they see their favourite books on screen, with good reason. Some directors take a wrecking ball to the original book, as was the case with My Sister’s Keeper, when the brilliant ending was changed despite the novelist Jodi Picoult’s request. And while some films are faithful to the book, they fail to capture its spirit. This was particularly noticeable in the film adaptation of The Time Traveller’s Wife by Audrey Niffenegger. But sometimes films can do books a favour. They tie together the separate threads of a story, highlighting the best aspects of it, which you might have missed when you were reading the book. They get rid of all the flab and let the writing shine through. In my humble opinion, there are three book-to-film adaptations that are particularly successful in this regard. When you’re writing a book by winking one eye, which was what Jean-Dominique Bauby did in his account of his life before and after developing locked-in syndrome (almost total paralysis), it’s hard to go into detail. This is a beautiful and moving collection of memories, but the film adaptation by Julian Schnabel turned those memories into a story and heightened their emotional intensity, creating a more complete portrait of the man. In other words, it improved on the original material. This film is a heartwarming, life affirming tale packed to the rafters with spirited women who overcome all kinds of obstacles. When I bought the original novel by Fannie Flagg, I expected more of the same. What I got was a collection of Christian sermons, scattered anecdotes and recipes. I didn’t enjoy the sensation of being preached at and abandoned ship. I was dying to get hold of this memoir by Susanna Kayson. Any book that could produce a film as punchy and fiercely eloquent as Girl, Interrupted would have to be explosive stuff. What I got was a flat, one-dimensional tale, again a scattergun collection of memories. The film turned these into 3D, enabling viewers to get inside the heads of several characters at once. It also added layers of black humour and sexual tension. Anyone want to buck the trend and mention a film adaptation which outstripped the original book? Giving feedback in a creative writing workshop or writing group is a tricky business. The biggest problem I’ve encountered, as both workshop attendee and facilitators, is that people are afraid to do it. They think, “What right have I to critique someone else’s writing?” So they just murmur “That was lovely” and move on. At first, when a writer hears that their piece is lovely, they feel pleased. But five minutes later, the glow has gone. Think about what happens when you eat a chocolate bar – you feel great at first, but go into a slump five minutes later. But feedback that’s specific, whether positive or negative, has the same effect as a slow-releasing carbohydrate – a steady glow that lasts long enough to bring lasting change to your writing. The American choreographer Liz Lerman identified this problem 20 years ago among her dancers, who would either give vague praise or tear each other limb from limb. She created a critiquing process that creative people can use as a template for giving each other worthwhile criticism. I’m going to outline the basic principles for you now. Though aimed at writers, they apply to any art form. Accepting negative feedback, no matter how well-worded, is never easy. But it is easier to swallow if they get to decide what feedback they want. They’ll probably have struggled with a particular issue when creating the piece; for example characterisation or plot. Because they know they’re struggling, they’ll be receptive to what the group has to say and you know they’ll genuinely benefit from the critique you give. The next stage of the Lerman method is discussions of the theme of the piece. This can be fascinating, but be careful that you don’t allow discussions about the theme to override discussions about the actual structure of the piece and the quality of the writing. You must always think about how you can be of benefit to the writer. So why is constructive feedback a good idea? Because it shows that you care. The worst reaction any writer can get is a non-reaction. By taking the time to give specific feedback, you’re showing them that their writing is of value, that it’s worth developing further. You’ll be helping to make their writing stronger, and maybe even achieve their goal of publication. Do You Need to Spell Well to Write Well? This is a question people often ask me when they come to my creative writing classes. They feel self conscious about their education, or their standard of education in general. The school system encourages them to equate good grammar with writing ability. They almost feel that they have no right to write, because they struggle with spelling. Here’s the truth as I see it: good writers tend to be good spellers, but you don’t need to be a good speller to be a good writer. If you’re interested in writing, you’re likely to have a strong understanding of how language works. The rules of language make sense to you, and you’re able to see the patterns in words, which makes it easier to spell them. If you’re a reader, you’ll subconsciously absorb the mechanics of language and your vocabulary expands. This all feeds into your writing. But defining writing in terms of spelling and grammar is like saying someone’s a good artist because they can put together a jigsaw. It’s the person who drew the images on the jigsaw who’s the artist; in other words, the person with the ideas. Great writing is about ideas and passion. It’s about your ability to create compelling characters and a fascinating world for them to live in. You don’t need to spell well to do that. You just need an instinctive understanding a story. So don’t let struggles with spelling or grapples with grammar stop you putting pen to paper. Just get the ideas down, and when you’re done, find a good editor or proofreader to help you bring order to your words. During the long and not-so-hot days of summer 2012, I helped sales executive turned writer Oisin Browne structure his book of 100 top sales tips. It was a thoroughly enjoyable process, as we teased out chapters and templates. 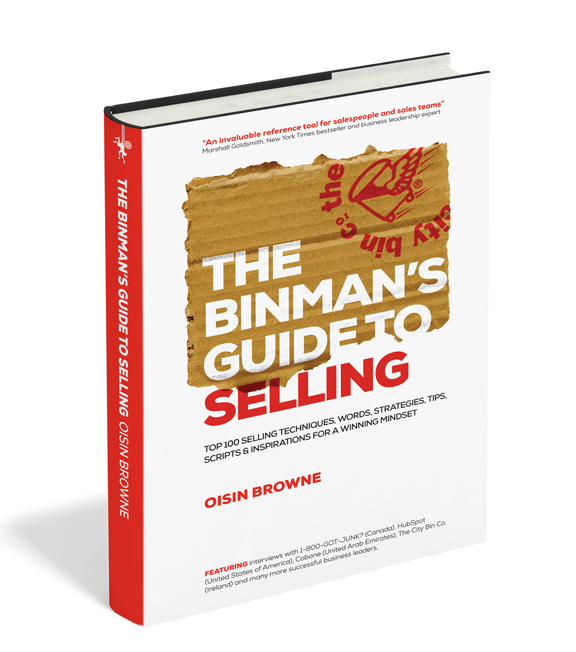 Now Oisin’s work has seen the light of day, in the form of The Binman’s Guide to Selling. Oisin self published the book, using CreateSpace for the ebook and a printing company for the hard copy. Since the book was launched on 23rd of May, Oisin has been caught up in a whirlwind of publicity. He’s used the sales techniques he’s honed over 15 years with The City Bin Company in Galway to gather valuable publicity for his books. I caught up with him to pick his brains about how to sell your writing. Sit back, relax and enjoy my first ever blog author interview. It’s always good to start with why. So why did you decide to write a book. I’m not your typical business person. When I was a teenager, I was into poetry. I’d go into Charlie Byrne’s bookshop in Galway and look at the poetry journals. I even got a few poems published. Then for years, I transferred my creative skills to the world of business. Being able to combine my creativity and my business skills (with this book) is an incredibly rewarding thing. Being able to launch my book in Charlie Byrne’s, the same bookshop I went to as a teenager, was like coming full circle. How did you approach writing the book? I had a blueprint in my mind before I started, but I needed to to create a template from scratch. I knew it was going to be about selling, but I didn’t know what I was going to put in each chapter. I began by creating my contents pages, with 120 tips, then I whittled it down to 100. Then I started to flesh each of the tips out, organising each of them into a format. It’s like writing little essays, a page at a time. I think no matter what you’re writing, it helps to break your story down. How did you gather the material for the tips. I chose to draw my material from life rather than books. They’re the result of more than 15 years’ sales experience. A lot of these tips are just common sense. The beginning, that thrilling sense that you’re jumping into water and you don’t know how deep it is. But looking back, I think I should have enjoyed the whole process more. The technical parts: figuring out the template and deciding what format to write the book in? Distribution was also tricky. But CreateSpace made the process easier and their customer support was brilliant. Bookshop distributers take a big chunk of your earnings, so I decided to go exclusively with Amazin. How did you use your sales experience to promote your book? Because a lot of the tips in this book come from my own experience, I decided to tell my own story. In interviews, I tell people about how I met my wife, over the counter at my local bakery. People are more interested in the story of you than the story of your book. So I figured out what story I wanted to tell. Presentation is also hugely important. I sent out my book in pizza boxes and when people opened them, they saw the book nestled on a bed of rose coloured shredded paper, all recycled because I work for a recycling company. Which of the tips in your book are most relevant to writers? Get your intentions right. Figure out why you want to write. Once you know your why, you’ll know your what. Get back on your bike – writers face a lot of rejection, so learn to take it in your strike, believe in yourself and keep going. And finally, don’t drop your trousers! Value your work and other people will too. What advice would you give to writers who want to improve their promotional skills? Figure out what your message is. I built my promotional campaign on three keynotes: the topic selling, writing a world class business book and the ability of employees to lead. I could adapt my message to whoever I was talking to. Build a web presence. Create a website that you can direct people to. Make it easy for people to buy from that website. I created Oisin Browne to tell my own story and Binman’s Guide to tell the story of the book. Both the sites are linked, so it’s easy for people to buy the book. Know your brand. Build a personal brand and a brand for your book. Think about what makes your book stand out and what will make people want to buy it. Make sure your book looks good. You have to stand back and think about how your book will look to the punter on the street. Getting a professional cover designer is the best investment you’ll make. Look at other authors. Who are the authors you admire? What choices have they made? How does their book look? Let them inspire you to be as professional as possible.